I seem to be having some problems with my texture pack (Here). These only happen in 1.9, not 1.8, so it has me a little confused. 1. The game does not use my lava. 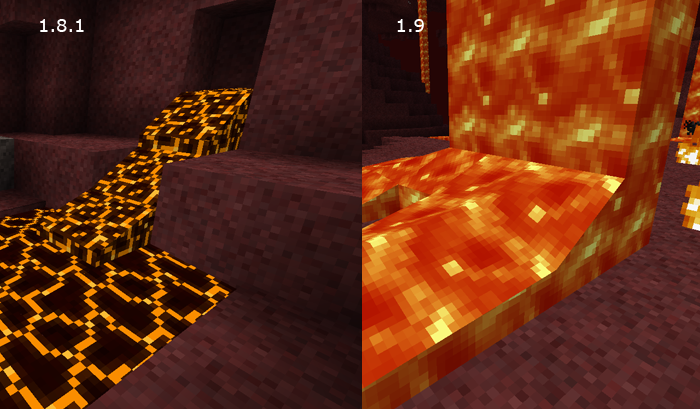 Note: I'm not using any custom animation, just the lava on the terrain.pmg. Has something changed about the way it works in 1.9? 2. One side of my chest is flickering. I'm aware that the top an bottom parts of the chests overlap, I fixed this in 1.8. In 1.9 the right side of the chests flicker. I did a search and couldn't find anything about these; so, I apologize if this has been brought up already. I think the lava has been dodgy for many versions. Try using the HD Patcher. Not sure about the chest flickering, though, aside from them overlapping. The HD patcher fixed the lava. I never thought of trying it, as my pack isn't HD. I can't reproduce the flickering chest anymore, with or without the Patcher. I don't know what's going on with that, I didn't change anything.